Thank you for your purchase, we hope that this timeless piece brings you as much pleasure as we had creating it. Do feel free to refer us to your friends and colleagues. Don’t take the watch into water, swim, shower etc. The watches are not waterproof unless stated. If the watch becomes wet it should be dried immediately. Carefully open all covers and use a hair drier on a low speed, to blow dry the movement, dial, covers, crown etc. this will reduce the amount of potential rust. If the watch becomes wet with salt water you should immediately immerse or spray (gently) the watch in fresh water, to remove all the salt from the movement, prior to drying the watch completely. Any salt left in the watch will combine with moisture in the air to rust metal components of the movement, case etc. Do feel free to treat the leather strap with protective oils, there are many products on the market as well as some homemade creations. Don’t subject the watch to violent jerky movements, for example mountain biking or heavy industrial work etc.. Most Cases and Covers are fine components and will not handle abuse well. The watch should not be shaken, beaten, or stressed. Although the watches are durable, they are more than 100 Years old in some cases, treat them with the respect they deserve. Winding any mechanical watch excessively may break the mainspring. Little and often is good, every 6 to 10 hours. When adjusting the hands of any watch, move in the clockwise direction only. Counter-clockwise adjustments may damage the movement. Annually is recommended to service and oil vintage watches. Keep the watch away from magnets. Strong magnetic fields can affect the accuracy of your watch since some vintage watches were made with iron based components in the movement. Check the operation of your watch: i.e. is the crown a “pull out” to adjust the time or is there a small pin on the side that has to be depressed to change the time?Some crowns have to be “pushed down to engage the winder, if not, they will make a rasping noise but not wind the mainspring. 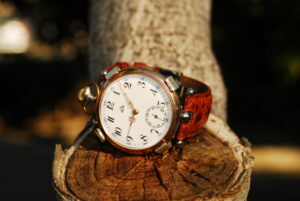 Antique watches generally experience an error of up to 3-7 minutes a day. Any accuracy of +/- 5 minutes is very good. The presentation boxes are made from solid walnut, they are treated with boiled linseed oil and beeswax only. The boxes can be maintained and given a lustrous shine by simply treating the same way, when required. Wood can change its form over time take care to avoid splinters from the boxes. We do not repair watches at this time, if a problem should develop please seek a local horologist to assist you. Some countries do not allow the importing or exporting of certain animal skins. If you order a specialist watch strap, please make sure that your countries laws allow the watch to pass customs. Revenant Watches will not be held responsible for goods stopped, ceased or withheld at customs.